Providing you the best range of i-max led high bay light and multi terrain 4 head portable lighting system with effective & timely delivery. A sturdy long lasting quality electrical driver housing of compact and elegant design, suitable to give together with a range of reflector types and attachments, the right solution for low and high bay lighting requirement. LOKOZO Mini Mobile Lighting Tower Remote Area Lighting System is a self-contained, rechargeable, battery-powered light source with a multi-position telescoping mast that reaches a height of 2 meter. Built to go off-road where trucks and vehicles can’t, Rechargeable Mini Mobile Light Tower is a rapid deploying, emergency area light, self contained inside a Watertight Protector Case. An Intelligent Control system allows for variable light output levels from 1 to 100% power, and calculates and displays current battery life, allowing the user to regulate the intensity of the light and choose the desired run time. Remote control operation is supported via a free app for Android and connects via Bluetooth to give full control of on/off switching and variable output selection. The Mini Mobile Light Tower can give off enough light to cover an entire incident scene, Emergency work at night etc. 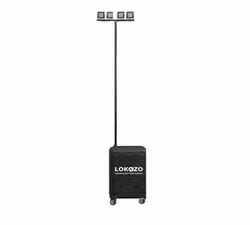 The LOKOZO Mini Mobile Light Tower is powered by rechargeable battery that offers 10+ hours of peak light and takes a mere 6 to 8 hours for a full charge. § All components fold into the watertight case for storage § Self-contained can be easily moved around. § The pole extends to a Min. Height of 2 meters (approx). § Built-in-charger Cool operating temperatures § No exhaust § Bluetooth Communication § Phone App to Control On/Off & Intensity through Bluetooth. §Dual USB power adapter § Housed in a LOKOZO protector case § Silent operation § Support Legs are provided. § All items are in built in side the case with wheels and extending handle-which makes it easy to transport. 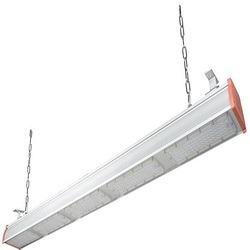 Looking for LED LINEAR BAY LIGHT ?